The end of the Cold War makes it possible, for the first time, to begin writing its history from a truly international perspective, one reflecting Soviet, East European, and Chinese as well as American and West European viewpoints. In a major departure from his earlier scholarship, John Lewis Gaddis, the pre-eminent American authority on the United States and the Cold War, has written a comprehensive comparative history of that conflict from its origins through toits most dangerous moment, the Cuban missile crisis. 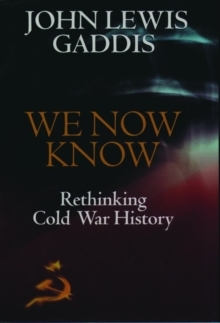 We Now Know is packed with new information drawn from previously unavailable sources; it also reflects the findings of a new generation of Cold War historians. It contains striking new insights into the role of ideology, democracy, economics, alliances, and nuclear weapons, as well as major reinterpretations of Stalin, Truman, Khrushchev, Mao, Eisenhower, and Kennedy. It suggests solutions to long-standing puzzles: Did the Soviet Union want world revolution? Why was Germanydivided? Who started the Korean War? What did the Americans mean by "massive retaliation"? When did the Sino-Soviet split begin? Why did the U.S.S.R. send missiles to Cuba? And what made the Cold War last as long as it did? This is a fresh, thought-provoking and powerfully argued reassessment of the Cold War by one of its most distinguished historians. It will set the agenda for debates on this subject for years to come.